Ananka's Diary: Amazing Squid News! 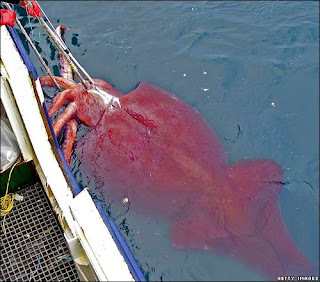 A COLOSSAL squid (Mesonychoteuthis hamiltoni) was recently captured off the coast of New Zealand! (Pictured below.) As squid lovers know, this species is even bigger than the giant squid. In fact, one expert was quoted as saying that if calamari rings were made from the recently captured animal, they'd be as big as tractor tires. 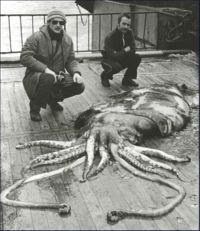 Very few colossal squid specimens have ever been discovered since the species was discovered in 1925.
how on earth did they catch that thing?! Whooooooooooooooa. BIG squid. REALLY big squid. I thought it was just a lot of blood in the water at first, but no! Cool. giant squid is a total obession of mine!! !